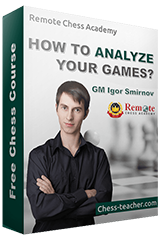 As the name of the position suggests, for this, you need to perform chess tasks like finding games/positions about a certain topic, analyze a certain position with computer. It may involve more advanced tasks like recording video lessons, writing chess articles or coaching. 2300+ FIDE rating and/or holders of FM, IM, GM titles. Knowing common chess programs (engines, databases). Familiarity with RCA free lessons and paid courses (it is desirable but not obligatory). Experience in developing chess lessons (it is desirable but not obligatory). Have You Studied Any Courses Of Rca? Which One? What Chess Software Do You Use Commonly (if Any)? Do You Have Experience In Internet Promotion?